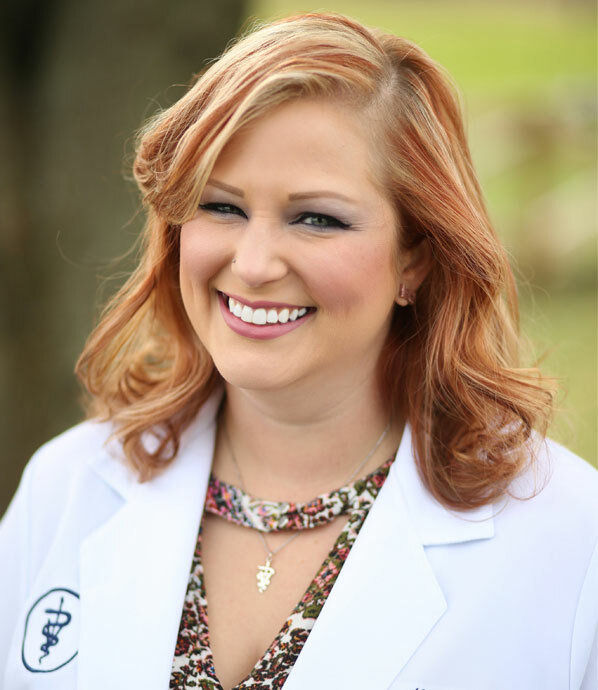 Dr. Nicole M. Headlee received her Doctorate in Veterinary Medicine from Auburn University (War Eagle!) in 2015 and her Bachelor's of Science in Biology (with minors in Animal Science and Military Science) from Western Kentucky University in 2011. Prior to completing her degrees, she served over six years in the United States Army, including a deployment to Iraq. Upon graduation from Auburn, Dr. Headlee practiced in a well-respected hospital in Houston for 1 1/2 years. She and her husband, Brian Peterson, wanted to be closer to their family, so they headed to Ohio in 2016. They share their home with their energetic and sweet yellow Labrador, Lemon, and three awesome cats (Marc Andre Fleury, Kekhula, and Moses). They have also started raising chickens and love the fresh eggs they get daily! Dr. Headlee's areas of professional interest include surgery, dermatology, internal medicine, exotic pets, cardiology, feline medicine, and hospice care. For fun, she enjoys music (singing, playing the piano and clarinet), hiking, kayaking, weight lifting, reading, and watching Pittsburgh sports. Geena is a registered veterinary technician (nurse) who earned her degree at The Vet Tech Institute at Bradford School in 2017. She is very passionate about the work she does and has special interests in animal behavior, dentistry, and emergency medicine. Geena has two dogs, one cat, and two leopard geckos. Her hobbies include singing, sports, concerts, and photography. Gabriela is a recent graduate from St. Thomas University in Miami, Florida where she earned her Bachelor of Science in Biology. She is originally from San Juan, Puerto Rico where she developed her interest in Veterinary Medicine at an early age. She started shadowing at a local veterinary clinic when she was in the 8th grade and has volunteered in multiple clinics and animal shelters since then. Gabriela’s ultimate goal is to be accepted to The Ohio State University Veterinary School to become a veterinarian. She loves working with both small and large animals. Currently, she has a dog, Niko, and a guinea pig, Diego. Her hobbies include working out, going to the movies, and spending time with her pets. ​For the majority of her career, Max worked as a global logistics analyst, serving as a strategic intermediary for the importing of goods from countries around the world to the United States. Throughout her career, she developed an intensive background in communication and administrative tactics. Max’s true passion has always been caring for animals, which led her to Cedar Hill Animal Clinic. Her warmth is sure to make you feel right at home when you walk through our doors. Max enjoys spending time with her family, especially her husband, Chris, her daughter, Ali , and son-in-law, Andrew. She loves spoiling her two tabby cats (Gryffindor and Arya) and her African Grey parrot (Bubba), as well as her fur-grandchildren, a Golden Retriever (Asher) and two more tabby cats (Robin and Remington). She has cared for several fur children throughout her life. Max also enjoys taking trips to the Columbus Zoo, watching and reading Sci-Fi, and cheering on the Ohio State Buckeyes and the Cleveland Indians.